This is a favorite summertime dish because I can make it on the grill, a cooking method I just love because it gives foods such a tasty, smoky aroma. 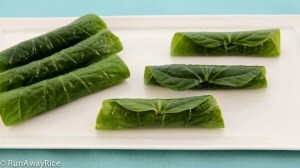 Betel leaves are a tender green with a fragrant aroma and a slightly bitter taste. 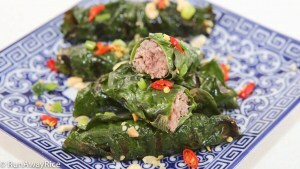 The leaf is sturdy and when grilled gets a bit charred which further enhances the savory flavor of the beef filling. 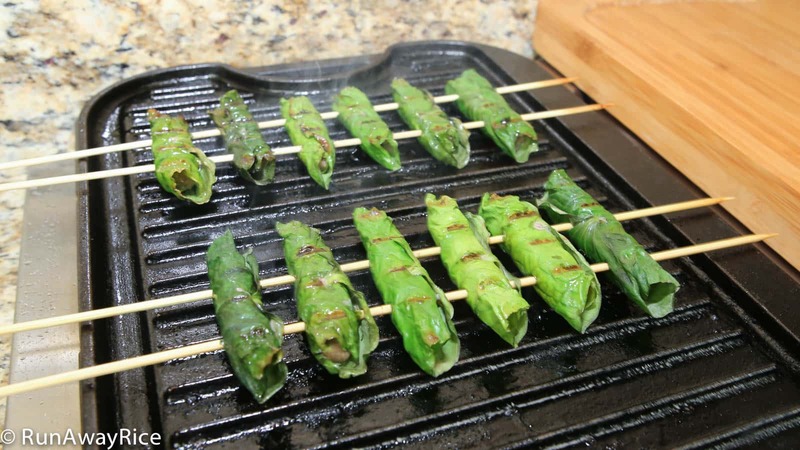 When cooking outdoors, I put these rolls on skewers to make them easier to grill and serve. Most of the time my guests just eat them right off the skewers. It’s the perfect finger-food! If you’re looking for a unique dish to introduce to your family and friends at your next barbecue, give this easy recipe a try. It will surely become a favorite! Depending on where you live and the season, betel leaves can be very difficult to find (and expensive). Some Asian grocers carry frozen leaves and it’s a good alternative to the fresh ones. If you’d like to freeze the fresh leaves, wash and dry the leaves thoroughly. Lay the leaves between layers of paper towels, place into a resealable plastic bag and freeze flat. They are good for up to 3 months. 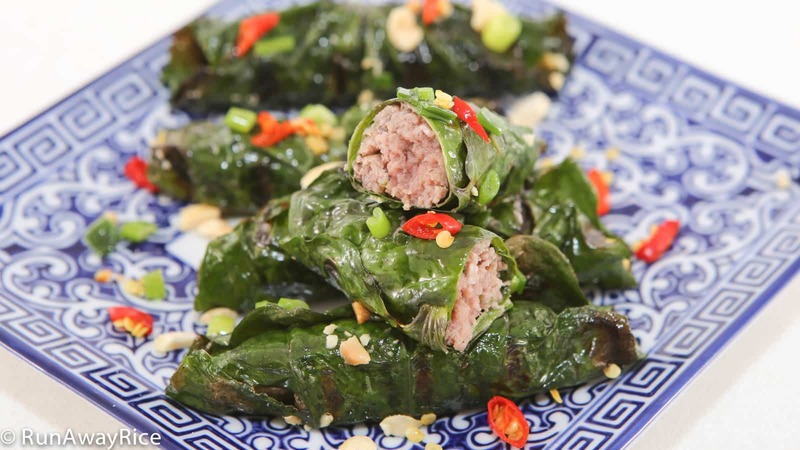 Can’t find betel leaves? The following are wonderful substitutes: perilla leaves, shiso leaves, grape leaves, spinach or other large leafy greens. I use an 80/20 ground beef when grilling to keep the meat moist and flavorful. Instead of grilling you can bake in the oven at 450 degrees F. Bake for 5 minutes, flip the rolls and then bake for another 3 minutes. Cooking over the stovetop works too but use a deep pan as the rolls splatter oil with the fattier meat. Watch to video below for instructions. Cut off the leaves leaving a small section of stem on each leaf. Place the leaves into a large bowl filled with cold water. Gently scrub both sides of the leaves. Wash the leaves one more time using fresh water. Use a salad spinner to dry the leaves or blot them dry using paper towels. Spread the betel leaves on a kitchen towel. Place another towel on top. (This helps to flatten the leaves.) Let the leaves rest while continuing with the next steps. Add the ground beef, Vodka 5-Spice Marinade, sesame oil, fish sauce, oyster sauce, corn starch, lemongrass, green onion and black pepper into a food processor. Pulse for 1 minute. Transfer some of the filling into a pastry bag. Cut-off the end of the pastry bag making a small hole. Place a betel leaf with the shiny side facing down. Squeeze out a small log of the filling, placing it toward the top of the leaf. Starting at the top, roll the leaf around the filling almost to the end. Using a toothpick, poke a hole into the side of the roll, lining it up with the stem. Insert the stem into the hole and press gently. Continue making the rolls until all of the filling and leaves are used. Grill the rolls over Medium heat for approximately 3 minutes on each side. To serve, top with a generous amount of scallion oil and crushed roasted peanuts. This can be served as finger-food or an appetizer. Alternatively, serve over rice vermicelli with carrot and radish pickles, fresh greens, and fish sauce dipping sauce for a refreshing meal. Substitute with 1/4 tsp 5-spice powder. Enjoy the recipe! It’s better to freeze the uncooked ones. You can then grill or bake them frozen. 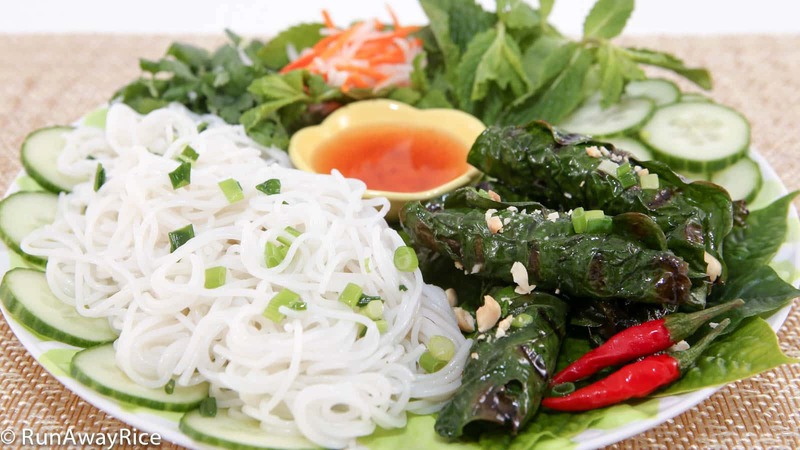 Once cooked and frozen, the betel leaves get a bit soggy when thawed. They’re still good but not the best looking.